Many delay plugins today are either trying to directly emulate tape delay or have a tape delay setting. Setting up a tape delay used to be one of the first things you learned how to do when you started in the studio back in the day, since there was no other way to accomplish the task (this was before outboard digital delays came into widespread use). Today very few studios have a tape machine, so most engineers, producers and musicians don't really know how the real things works. Here's a short excerpt and diagram from The Mixing Engineer's Handbook 3rd edition that describes tape echo. "In the analog days delay was accomplished by using an outboard tape machine. 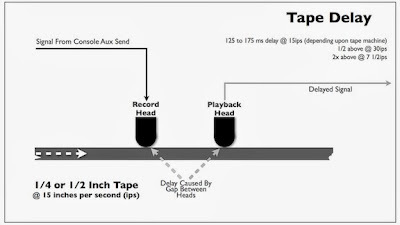 The delay occurred because the playback head was located after the record head, which created a time delay (see the figure on the left). As the speed of the tape machine was changed, so would the delay. 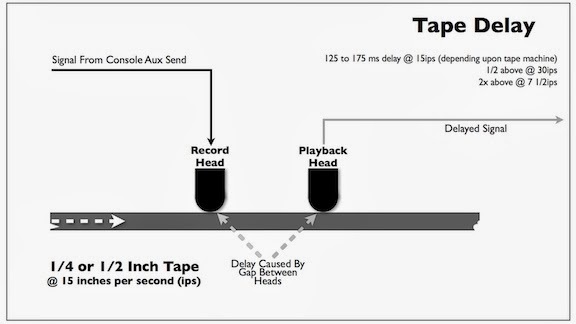 For example, a 15 IPS (inches per second) tape speed would result in a delay somewhere in the 125 to 175 milliseconds range (it would be different with different models of tape machines because the gap between the heads was different for each), while it would be double that, or around 250 to 350 milliseconds at 7 1/2 IPS. Because of the analog nature of magnetic tape, it has the characteristics of wow and flutter of the tape path, plus a rolled-off high frequency response and increased distortion with each repeat, which most tape delay plugins try to emulate." You can read additional excerpts from The Mixing Engineer's Handbook 3rd edition on the excerpt section of bobbyowsinski.com. If you've read this book and enjoyed it, please leave a comment on Amazon. Thanks! In you book "delaying the reverb" is often mentioned. How is this replicated in a DAW / plugins. It wouldn't be the "pre delay" setting on the reverb would it? Yes, pre-delay is the same thing. If you want to simulate the old tape delay before the reverb trick, insert a tape delay plugin (or a delay with a tape delay preset) in front of a reverb plugin.